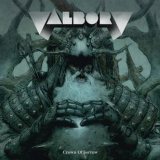 Featuring Klabautamann’s drummer and sounding roughly like what you’d get if you crossed Triptykon with David Bowie and asked them to play space rock, German trio Valborg here present a lovely third full-length that has succeeded in rocking my socks each time I listen to it. From the opening psychedelic hum of Wisdom From The Vortex, launching in and out of dread-coated blackened death metal akin to Akercocke in a reflective mood, it’s genuinely hard to stop listening, and quite why Valborg aren’t better known is beyond me. Quality seeps from every pore, the atmospheric Doom-coated tumblings of Ancient Horrors appreciable from both a death metal and proggy perspective. And my god, these musicians seem aware that people are into the music they are playing, and don’t ruin it by constant growls or yelps! The instrumental sections are always interesting, and the band keep you on your toes by rocking out deliberately and with a real sense of fun – the thrashy speed of Thunderbolt mixes nicely with the surrounding proggy melody. It’s worth pointing out that the choice of vocals there is particularly inspired, croaky melodramatic spoken word for once fitting in well with the music. You can tell I like this album, as I’m in serious danger of waffling. I could wax poetic about nearly any track present... for example, the melancholic Tristesse deserves a paragraph in its own right, dejected vocals over a gentle acoustic strum strangely moving. My mention of Triptykon in the first sentence was hardly hyperbole – listen to the funereal Crying Under The Fortress Of God and tell me that couldn’t have taken proud place on Eparistera Daimones. Yet it’s where Valborg take their own steps into the unknown that is most impressive, the eleven-minute monster I Am Space really stealing my heart and making me elevate this review in the list over others. Starting with a heavy dose of that aforementioned Bowie over heavy metal riffing, the track swings along with surprisingly catchy invocations about creations of gods before suddenly going psychedelic with cymbal-tapping drums behind a series of melodic voyages out into the unknown, more like Hawkwind than anything. The band are clearly fans of space rock, those interstellar synths unmistakeable in their BBC cheap sci-fi vibe, and immensely enjoyable if, like me, you like that dated-yet-still-very-awesome style. One short bit of weirdness in the form of Saint Patrick’s Day later and the album’s all over, sadly seeming far too short at just under thirty-six minutes long. Clearly they wanted to leave you wanting more rather than wishing for less, but so enjoyable is the band’s brand of metal that another excellent ten minute track would have made it absolutely perfect. As it is, Crown Of Sorrow is a great album that will have great appeal to my fellow Triptykon, Akercocke and Hawkwind fans – go and find it!